The chapters in “Part II: Writing with Mobile Technologies” aimed to help instructors integrate mobile devices into classrooms “to bridge what students do in public life and what they do in the classroom” (Lutkewitte, p. 95). These assignments emphasized authentic learning experiences in meaningful locations to support composition learning and transfer. Since these chapters focused on assignments using mobile devices, they may be harder to implement in classrooms with limited Wi-Fi access, or with students with limited mobile device access. Part II offered eight different assignments that focused on student critical engagement and use of mobile technologies. These chapters explored the use of mobile devices in different university locations, including composing with devices beyond the classroom (Holmes Chapter 12), for writing portfolios (Chapter 9), and in online classrooms (Chapter 10). These very different assignments allow instructors space to adapt the assignments to fit unique situational needs. Not all assignments may be right for every composition classroom, but the variety should inspire instructors to play with the assignments to fit their unique classroom needs. In this section, I end each chapter discussion with a tweet, my preferred place to write on my mobile device. 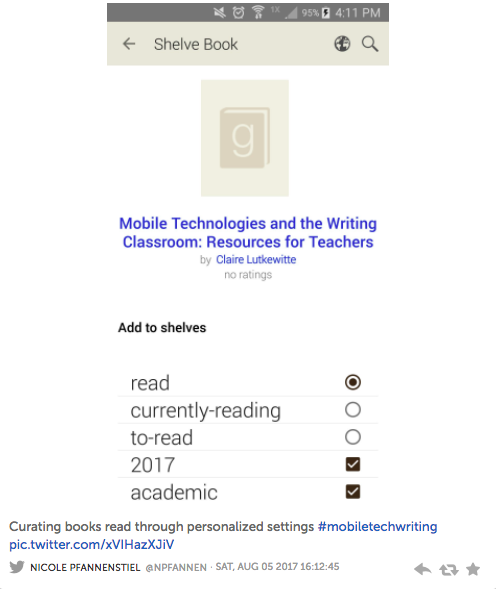 Since the chapters included in Part II engaged with assignments that asked students to compose with their mobile devices, I used my mobile device to engage with the content of each chapter as I read or re-read it. Mirroring the theories underlying these chapters, my incorporated tweets demonstrated reflecting on, composing, and engaging with the chapters through my mobile device. These tweets also reflected the need for educators to practice composing with mobile devices in our own writing to better support students as writers with their mobile devices. Chapters 7 and 12 described assignments that asked students to engage with place and mobile devices. In Chapter 7, Jessica Schreyer described an assignment founded in four key pedagogical ideas: 1) mobile devices are pervasive and useful to learning, 2) mobile devices support collaborative writing, 3) mobile devices support reflection that creates new understandings of literacy, 4) mobile devices support considerations of place (p. 103). Schreyer’s assignment asked students to reflect on places on campus they visit, and who they interacted with in those spaces. Together the students found they interacted a significant amount with digital technologies as they interacted with peers in places on campus. In Chapter 12, Ashley Holmes described assignments that asked students to engage with place-based invention and composition. Similar to earlier chapters in Part II, Holmes scaffolded mobile technologies across multiple assignments to support student engagement and composing. Holmes assumed that “digital technologies have a tendency to distract us from our physical surroundings,” offering her place-based approach as a way to aid students in critically engaging with place. However, is this a safe assumption to make? A subject librarian (Michele Santamaria) at my institution used images of her walk from her car to her office in support of invention. She then used her mobile images within her chapter. I've included the image in the tweet below as a purposeful delinking of place. 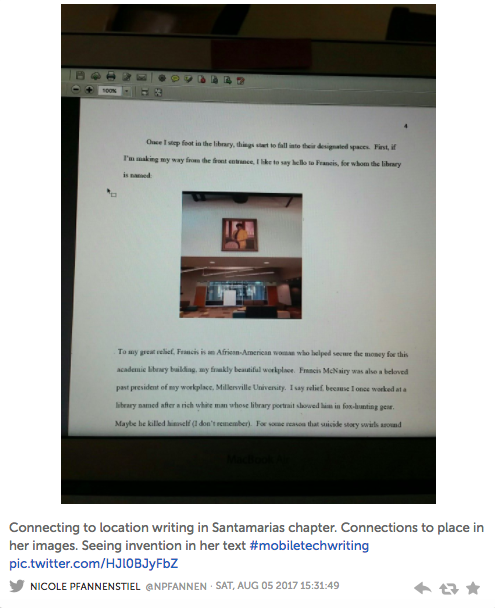 I viewed Santamaria's places through my screen, then copied them to Twitter place using my created hashtag for this project (where the hashtag also becomes place). While I enjoy Holmes’s location-based assignment, I wondered how much students are already engaging with place and location, and how underestimated their complex understanding of place and location may be. Chapters 8 and 14 described assignments that asked students to use mobile devices as they considered and wrote narratives. In Chapter 8, Casey McArdle described a “tech-literacy autobiography” that asked students to “rhetorically analyze themselves and their actions” (p. 123). Most students began to recognize how connected they were to mobile devices, and how they struggled to complete tasks without their device. 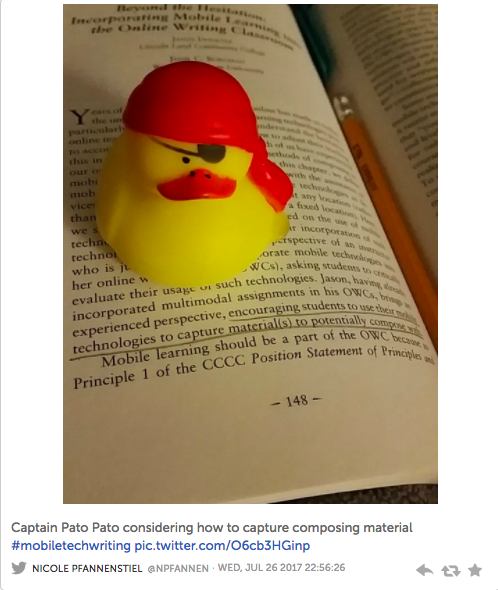 McArdle described a series of smaller assignments that asked students to engage with their mobile devices, including mapping their personal campus, collecting tweets, and defining their composition course. McArdle’s scaffolded assignments provided a glimpse of meaningful engagement with mobile technologies across multiple assignments in the course. They may also offer ideas for scholars and researchers to engage with technologies in their own work that will allow for even more rich assignments in composition courses. In Chapter 14, Mike Tardiff and Minh-Tam Nguyen described a familiar assignment, the literacy narrative, reimagined through a mobile device. Tardiff and Nguyen described an adaptable assignment that scaffolded mobile device use while supporting composing processes and multimodal composing. These examples provided great information for instructors wanting to assign or reimagine the literacy narrative. Chapters 9, 10, 11, and 13 described assignments and integrations of mobile devices to support instructor curricular goals. These assignments and uses of mobile devices may support existing assignments, or may help instructors rethink their approaches in the composition classroom. In Chapter 9, Josh Herron described a mobile learning initiative that used a mobile electronic portfolio system. In a study accompanying the system change, Herron and his research group found that students reported preferring the mobile electronic portfolio system to the paper-based system, demonstrating that when implemented with supporting pedagogy in meaningful ways, a mobile electronic portfolio can support student process writing. While this study focused specifically on process writing, institutions should consider the culture of their universities when considering digital initiatives, especially those that support good writing. Similar to the assignments described by McArdle in Chapter 8, Herron’s initiative was a university wide, electronic portfolio with accompanying supportive pedagogy. Together, these two studies raised a lot of questions about the connections between supportive pedagogy, student successful adoption of digital tools, and the support of writing. In Chapter 10, Jason Dockter and Jessie Borgman described various assignments incorporating mobile technologies into online writing classrooms. The authors offered suggestions to vary the assignments based on the familiarity of the instructor with mobile technologies in composition courses. Dockter and Bogrman focused on the idea of supporting students as they captured possible materials to support multimodal compositions. These assignments offered suggestions for making the online writing course more accessible to students with the use of mobile devices. While these assignments varied based on instructor experience, the assignments for instructors just beginning to include mobile devices in the online composition course could be used by any instructor. The assignment details differed more based on the level of tech support an instructor can provide for students struggling to use their devices effectively. In Chapter 11, Ghanashyam Sharma and Soni Adhikari described videocapturing practices in the context of teaching writing, including how video supports instructional materials, feedback, working with students, and student creativity. While Sharma and Adhikari provided compelling assignments for including videocapture to support composing, in my personal experience, students fear the video technology leading to tech struggles and poor composing due more to comfort than ability. How could video integration support good composing despite student fears? While I often required mobile devices in my own classroom, I felt very anti-tech while reading Dockter and Borgman’s Chapter 10 and Sharma and Adhikari’s Chapter 11. As instructors move toward integrating mobile technologies, how much class time could be required as tech support instead of composition support? Essentially, how do we successfully allay student technology fears so they focus on multimodal composition and learning to compose? In Chapter 13, Randy Nichols and Josephine Walwema focused on supporting student understanding of digital aggregation and curation in support of digital research and composition. Nichols and Walwema focused their discussion on how digital aggregation and curation allowed novices in the class to learn from experts, pretend to be experts, and importantly how these practices disrupt the teacher as expert. While this is an interesting assignment, with many benefits to students, I wondered about the personal connection students and instructors may feel to their own digital aggregation and curation. I’ve included my own personal Goodreads curation as an example below—and I purposely structured the image to represent what I was willing to share about how I curate the books I read in digital space. Could discussions of RSS feeds, podcast listening, and/or book curation become too personal, shifting the focus too much away from curation and on the cultural connection?